Much of the MPLR rolling stock is built from I.P. Engineering kits. Mainly from their ‘Lollipop’ and ‘P&S’ ranges. These kits are very good value for money, and for a beginner like yours truly, they are not difficult to build. 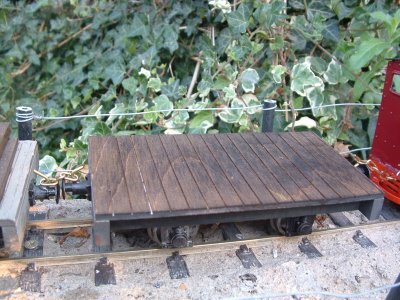 Being all wooden models, modification and embelishments are easy and a lot of fun. In 16mm land there is some ambiguity about scale. 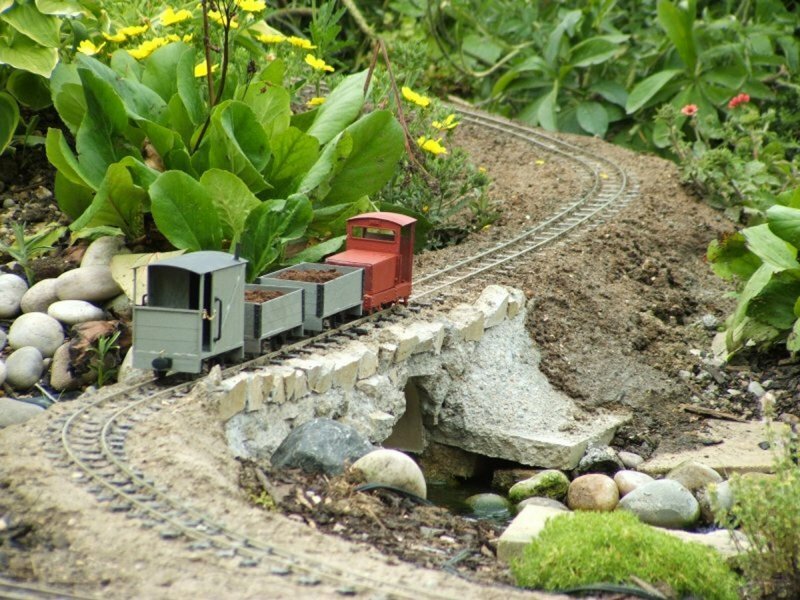 This is not the time, nor the place, for a long discussion about this, suffice to say that many 16mm garden railways are ‘flexible’ where scale is concerned. The above mentioned Lollipop and P&S ranges from I.P. are a good example of this. 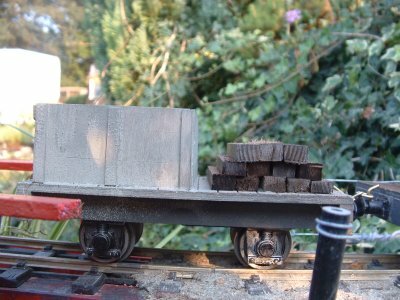 The Lollipop are true 16mm to the foot scale, whereas the P&S wagons/coaches are designed to look correct behind Accucraft and Roundhouse steam locos. The best way around this ‘scale’ problem is to keep ‘true’ 16mm stock well away from ‘AccuHouse’ stock. Not a problem, really, and it gives us something to argue about at garden meetings etc. 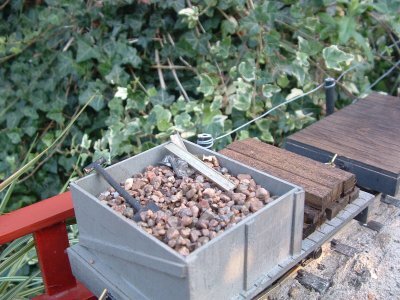 Ron, seen here crossing Moreton Bridge (right) is a true 16mm model, as is his train, whereas the maintenance wagon (below) is more ‘AccuHouse’ scale. Confusing ‘aint it? 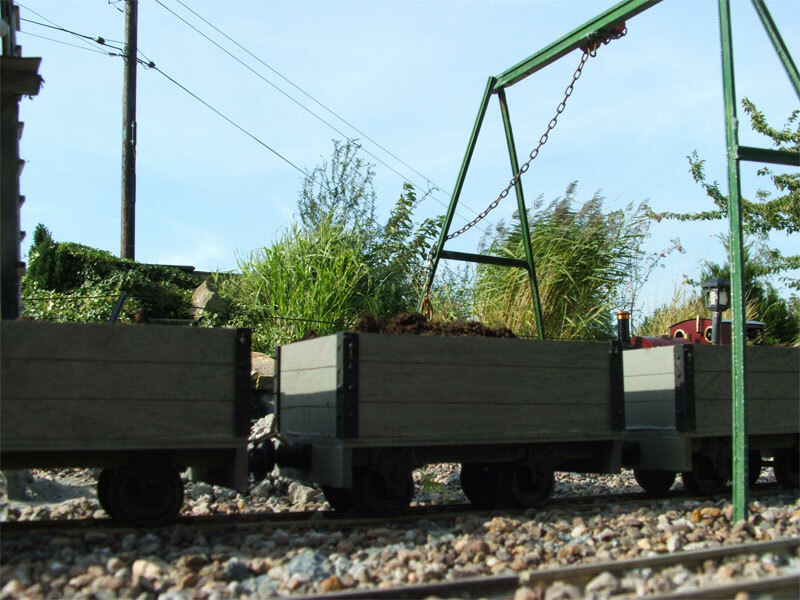 The Hudson skip wagons are in such use we just managed to get a photo of these two abandoned at the old mine workings! Here are a few more photo’s of some of the stock that the MPLR carries. As the MPLR started off just to enable the gravel to be carried away from the pit workings, the passenger service really only grew more important as the area became a Nature Reserve.Â So, the first carriages to be running on the line were only fairly modest.Â Â All the carriages shown in the next few photos have been made in the MPLR workshop.Â The MPLR also has 2 ‘3rd’ class carriages which were purchased some time ago but have already gone out of service due to the quality not being up to the MPLR’s high standards! 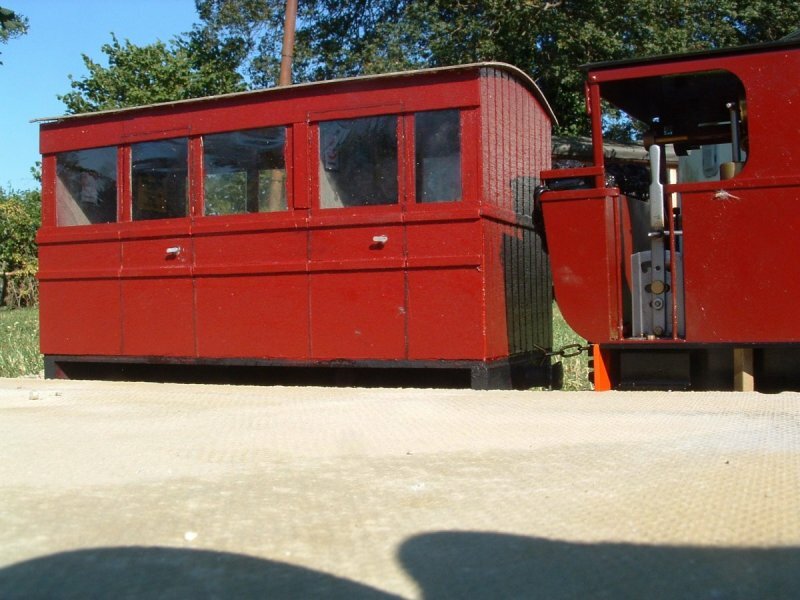 There are 4 matching carriages as seen above and 3 smaller ‘Welsh style carriages, one with a guards compartment. 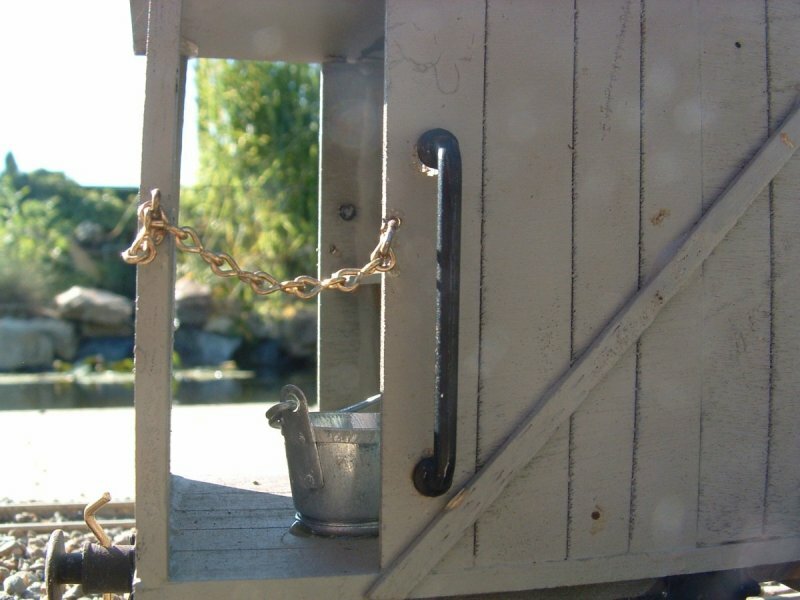 As well as the 1st class and 3rd class carriages the MPLR boasts an ‘observation’ carrriage, a glimpse of which can be seen in the photo below.Â Particularly pleasant to ride in on a hot summers day!Â Oh, and an open carriage for those who are not adverse to a bit of soot!